Not taking any chances, these Boscov’s Shopping Cart Rules and Regulations Built-In notices are rather all encompassing. First “Please leave at the store exit when done shopping.” There are no Boscov’s cart boys to collect from the parking lot or Mall parking arcade. 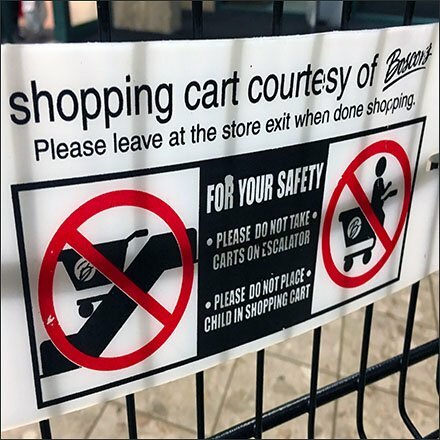 More importantly “Please do not take carts on Escalator” and for Pete’s Sake “Please do not place child in the Shopping Cart.” These Boscov’s Shopping Cart Rules and Regulations Built-In suggestions are aftermarket, but not an afterthought.